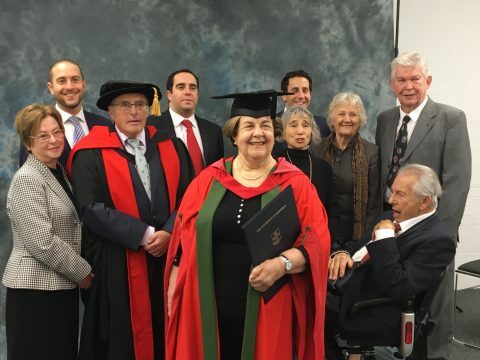 On 12 January 2018 I was very honoured to be awarded an Honorary Doctorate of Letters by Sheffield University for my work on the Holocaust. It is wonderful to have my work acknowledged in this way and to be called Dr. Grunwald-Spier by the University. We all, my three sons and my guests, had a wonderful day and the University could not have looked after us better. 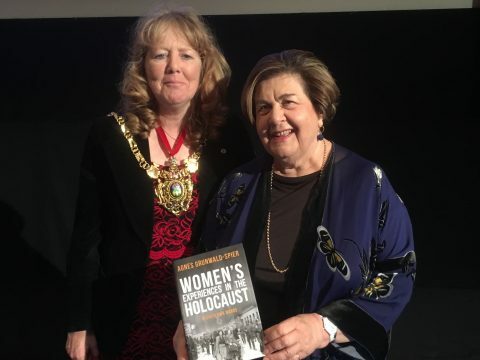 The University’s Chancellor, Dame Anne Rafferty, was very generous in her comments and the Public Orator, Miles Stephenson, described my story as a Holocaust survivor. I gave a short acceptance speech which was well received. We then went off and had a splendid Lunch in Firth Hall. I don’t have the official photos yet but this was taken by a friend beforehand. I am with my three sons, at the back, and my friends who came as supporters. The University posted my acceptance speech on their website for HMD. There are some inaccuracies in the introductory section about the train to Auschwitz. As a result of the award, I was invited to give a talk at the University. It took place on 31 January at 6.00pm in the Students’ Union Lecture Hall. 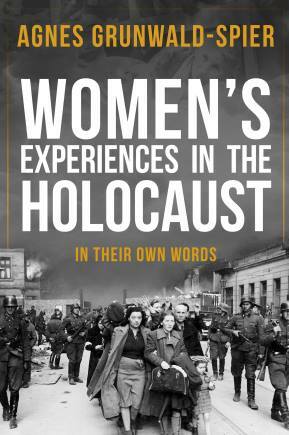 It was entitled ‘ Women In The Holocaust: One Hungarian Woman’s Story’ There was a very full hall and we sold lots of books. I was delighted with the response of the audience and the interesting questions asked. Some of the students e mailed me afterwards to thank me and ask questions. The lecture is now available to view online on the this University site. The University organised a small dinner afterwards in the Inox Restaurant which was lovely with great food and wines. The photo below is with the Lord Mayor after the lecture. I was interviewed by Chris Burn, an excellent young journalist, from the Yorkshire Post just before the lecture. The article was published on 14 February 2018 and is available here. On 25 April 2018 Simon and I were invited to the Alumni reception on the Terrace of the House of Lords. We had a great evening as it was still light and the views were wonderful – as indeed were the canapés. I was delighted to be mentioned by Miles Stephenson, the new Vice-Chancellor and Lord Blunkett who hosted the event. Apparently I am the latest graduate and that was why I was mentioned. A lovely evening meeting some really interesting people. 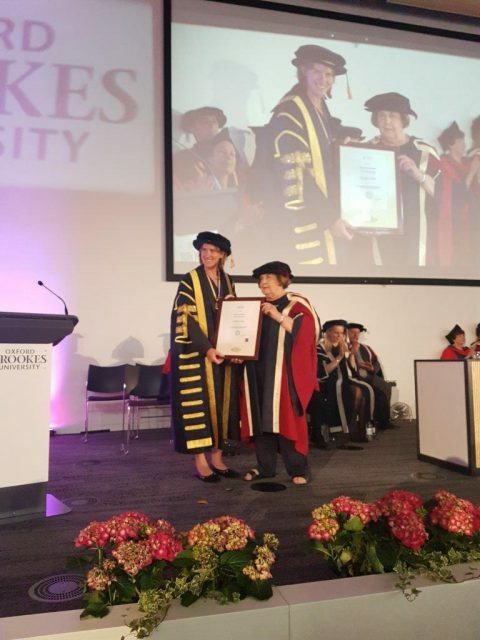 That Honorary Doctorate was joined by an Honorary Doctor of Arts from Oxford Brookes University on 22 June 2018. We had another amazing day and this time I received my degree from the Chancellor, Dame Katherine Grainger, the Olympic rower who was lovely. Dr. Marius Turda gave the oration and my acceptance speech was well received. 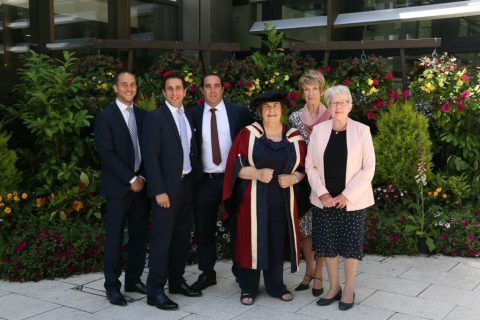 My three sons were joined my old college friends Alison and Sue – we lived together, in different places, in the three years we were at OBU 1963-1966. We have kept in touch all these years and it was great that they could come. We had a splendid Lunch with the Chancellor and other University dignitaries and afterwards went punting because it was such a glorious afternoon. It was wonderful. I was delighted to find OBU supplied the certificate already framed and photos were presented just before we left.